Network downtime is costly. Modern commerce depends on networks running efficiently. Productivity, disaster recovery, customer satisfaction, and your company’s reputation all depend on network availability. Are the nuts and bolts of your network management meeting the challenge? Increase network control by replacing your overly complex management tools with an integrated, centralized DNS/DHCP/IPAM (DDI) solution that gives you excellent network availability. Infoblox solutions meet business requirements while reducing the cost and complexity of managing your network. 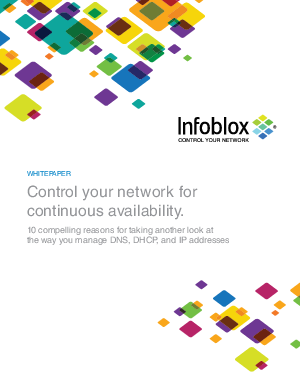 Read “Control your network for continuous availability,” to assess your network downtime risks and learn how Infoblox DDI helps deliver always-on network services.